← Our next meeting: July 7th, Charlotte Mew…and more! Here’s a business card flier that one of the Auteur 101 students designed for ANTH II. I like the half-dead cat/Lord Byron mascot very much, as well as the dead mice. 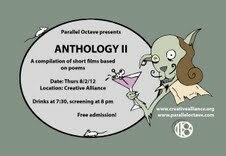 ANTHOLOGY II screens Thursday, August 2nd at 8 PM at the Creative Alliance. Free admission.